Disclaimer: Everything in this post was purchased by me! No affiliate links. It's Friday again! This week, one of Shiro Cosmetics' two annual big sales is happening, so I swooped up some makeup. A lot of makeup. More makeup than I really should have swooped up, really. It works out for you, though, because I purchased the night the sale started, and through a fortune of geography, managed to get my *two* orders before the sale is over. That's right, folks, everything in this post is still 20% off from Shiro until Sunday! So, the two main parts of my purchase were the new(er) Spring Sprung! collection and the brand new Multisticks. I'm going to post both today, but split it up into two posts for easier navigation. This first part will be the eyeshadows. It will include the full Spring Sprung! 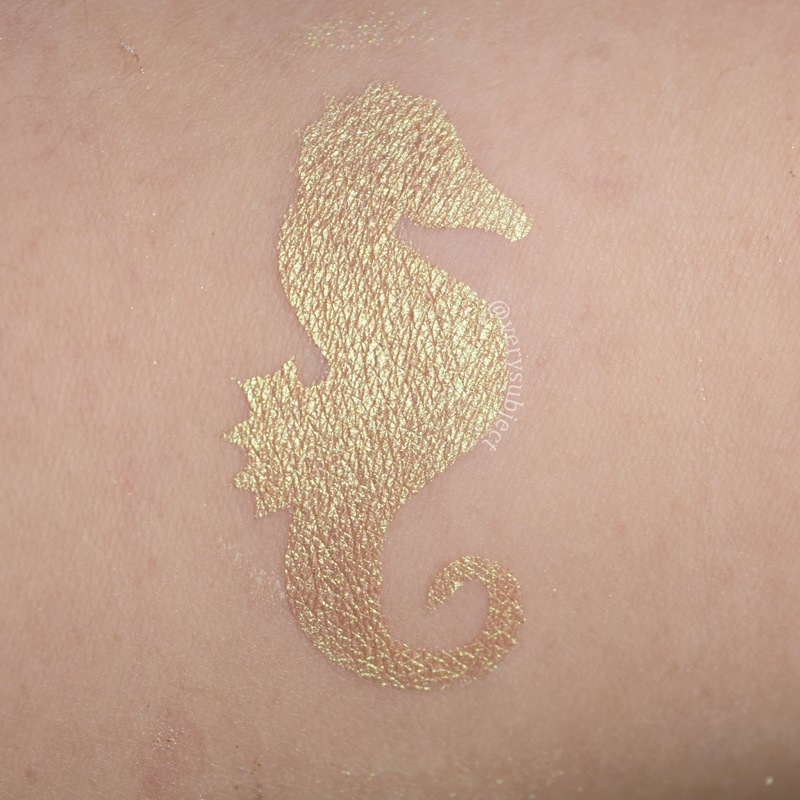 collection as well as three other shadows: Mermaid You Look, Sunshower, and the free gift with purchase Celebr-eight Good Times. 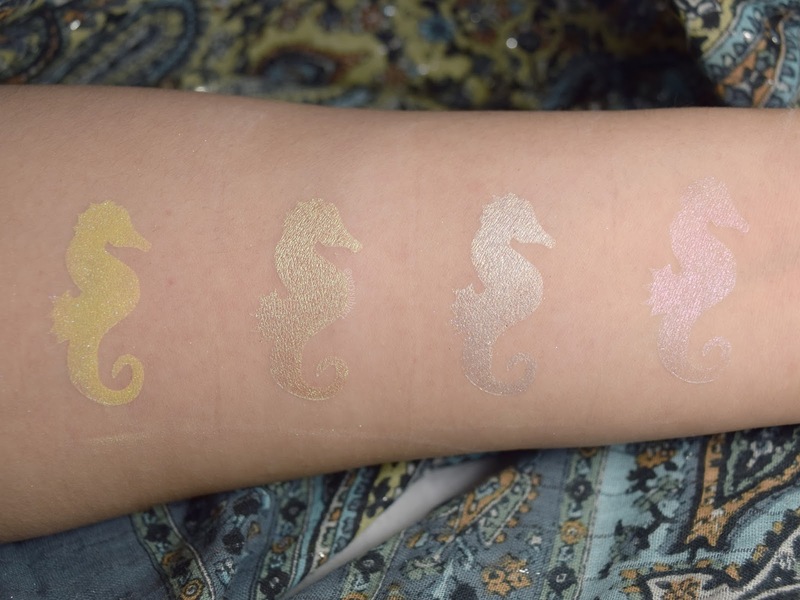 Click through for the swatches! 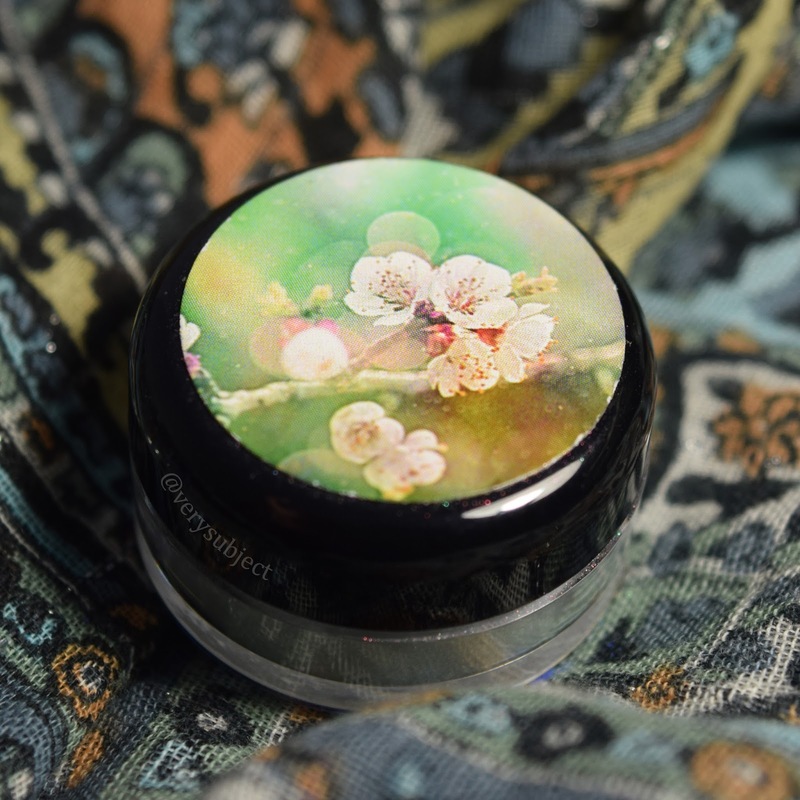 Spring Sprung is an eight piece seasonal collection of eyeshadows that also happen to double as highlighters! 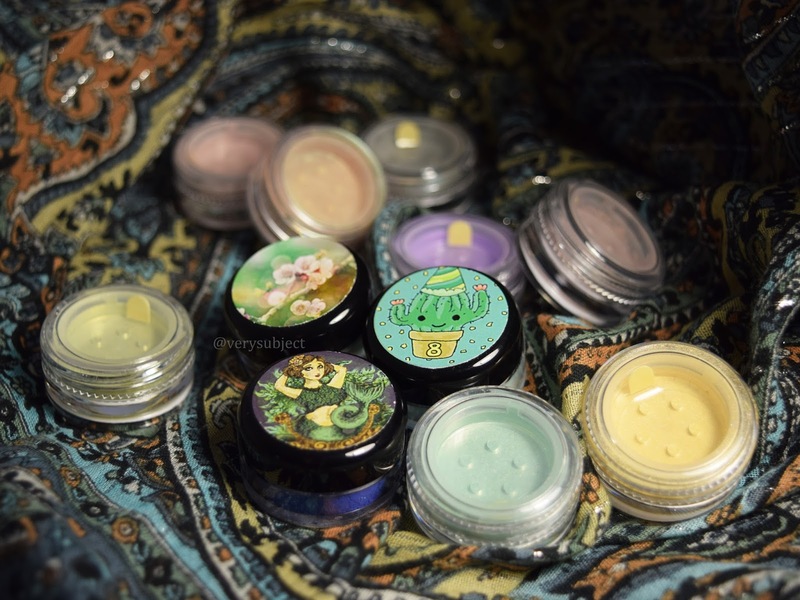 I bought the full collection in minis, but it's also available individually and in a set (as always) in minis, full size, or even in deluxe, which is a 10g jar. 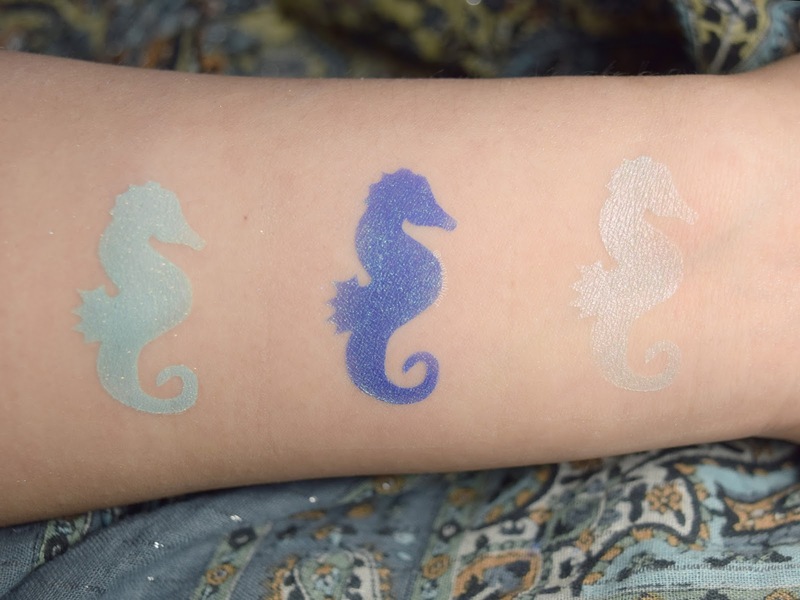 I was feeling a little under the weather when I made the vinyls for the swatches, so I didn't differentiate shapes between primer and sticky base shots. 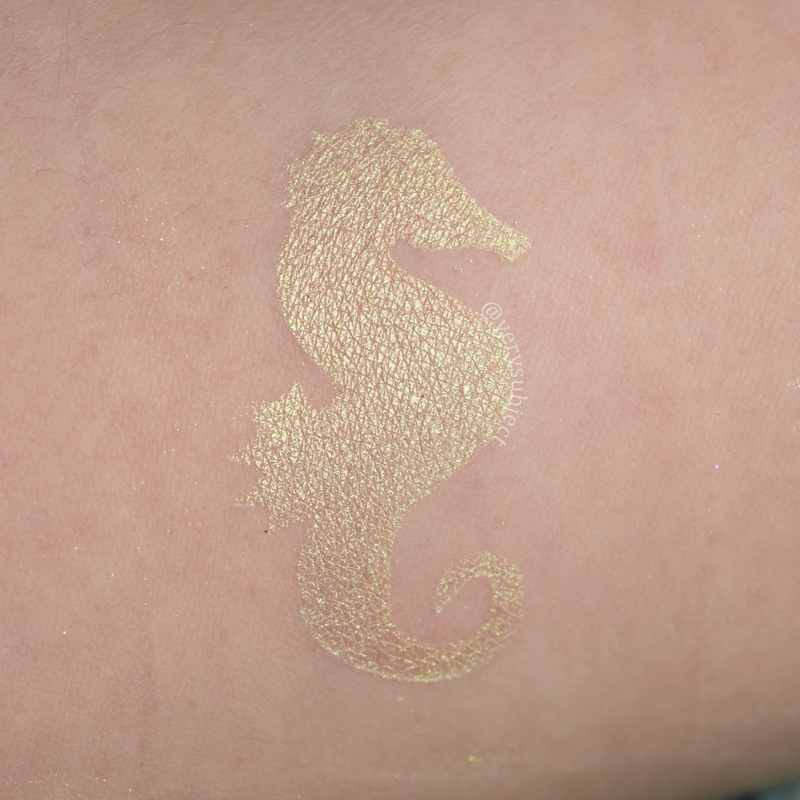 I did, however, make these regal little seahorses that look like mustaches when you tilt them on their sides. Yeah, I know, go ahead and try it. The Study of Migratory Blossoms is a petal pink shimmer. To my eye, it's similar to Shiro's discontinued Angry Cuccos, but with a pinker base. They describe it as "Sugary sakura-pink with peach and bright pink sparkle". 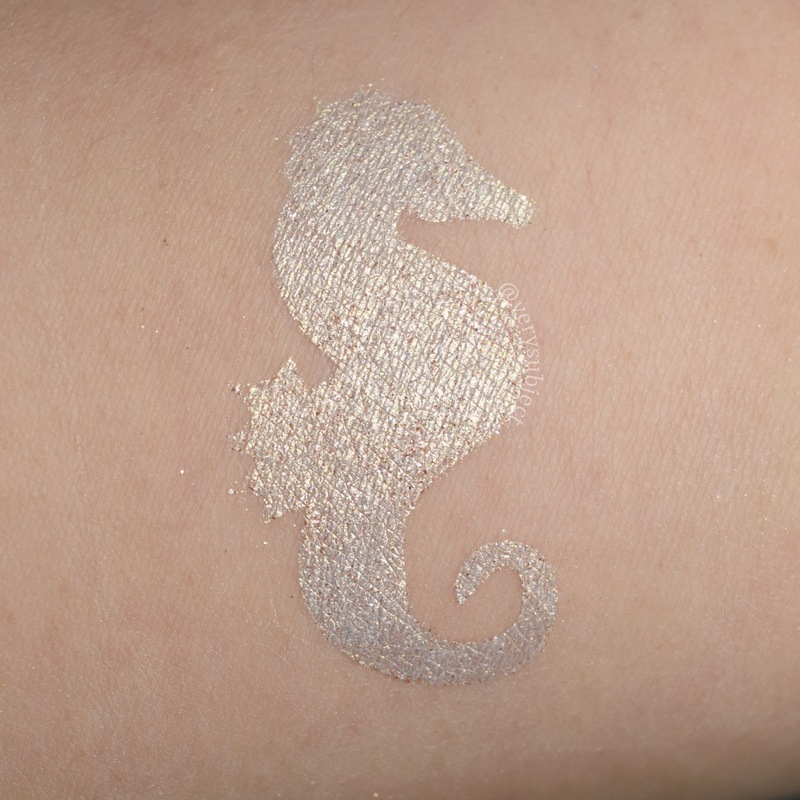 The shimmer is satiny and the shadow is sheer over normal primer, but really shines over glitter glue. 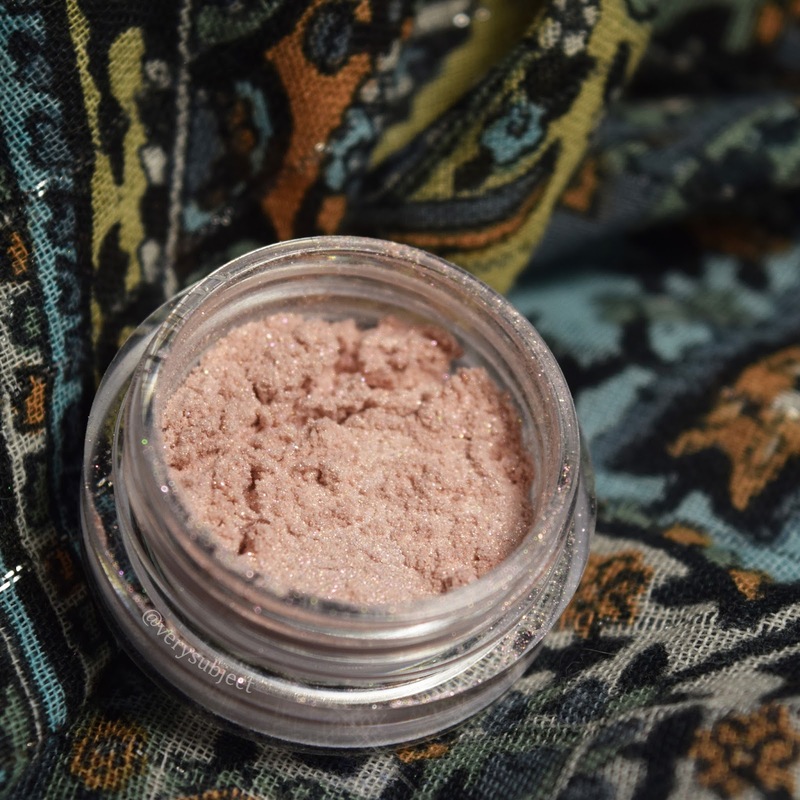 The lightness of the base and delicate, blendable texture make it perfect for double use as a highlighter. Treetop Tea Party is a coppery/gold shimmer with a pale cream base. I tried to put my swatches in rainbow order, and in the jar this looked like it would be between pink and orange, but it turned out much more like a white. Shiro calls it "delicate creamy bone-china base with copper glitter and a pink/gold shine". This is another one that I think makes a perfect dual use product due to how light and blendable it is without sticky base. 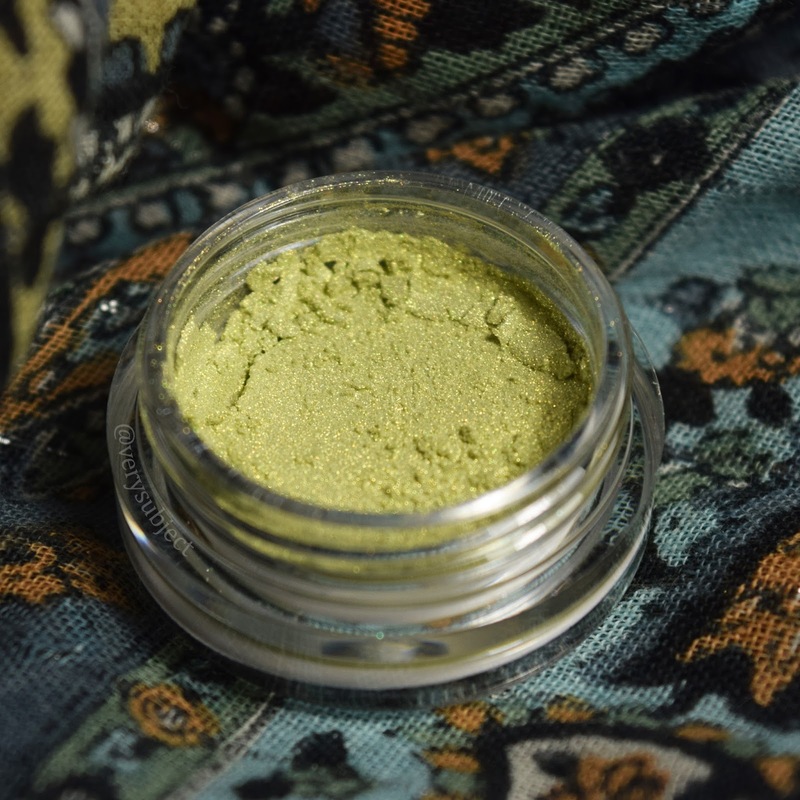 However, it does hold its own pretty well even without the sticky base, and has a really lovely glow to it that would be perfect for a halo eye or an inner corner highlight. I really like Petal-Capped Pastry! I'd probably put it as one of my favorites of the collection! 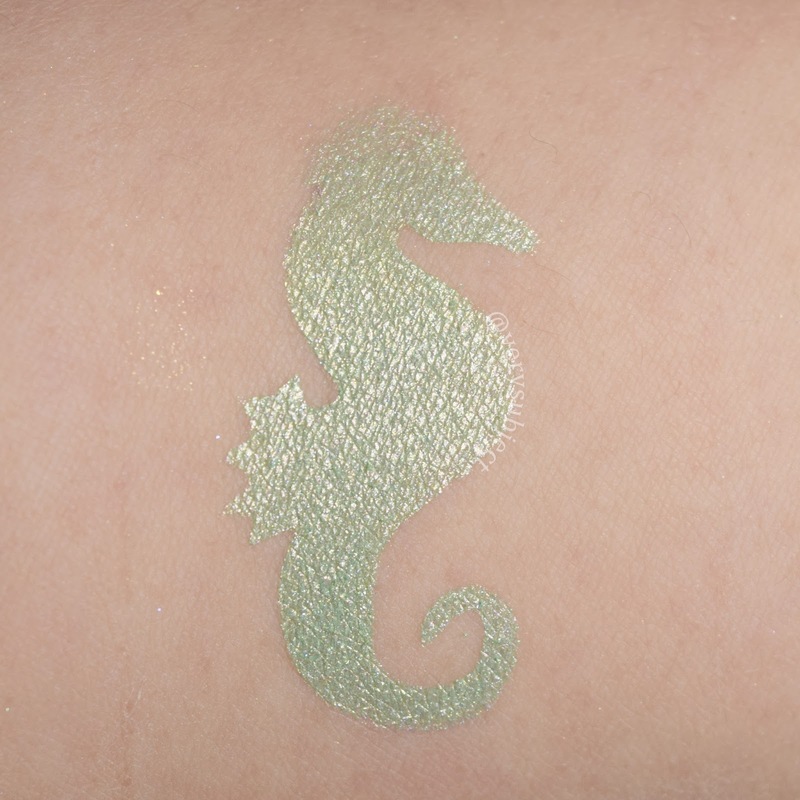 It's a gorgeous, lovely, smooth duochrome with pastel orange base and glorious green shimmer. 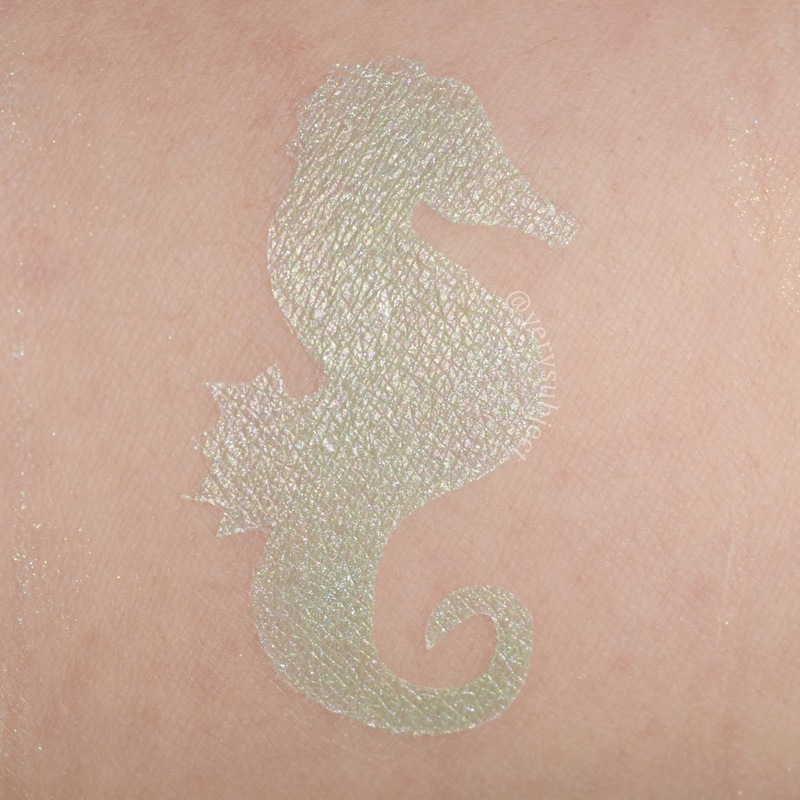 The green shimmer looks undeniably green to me in person, but it does tend to look yellower/gold because of how it's paired with an orange base. 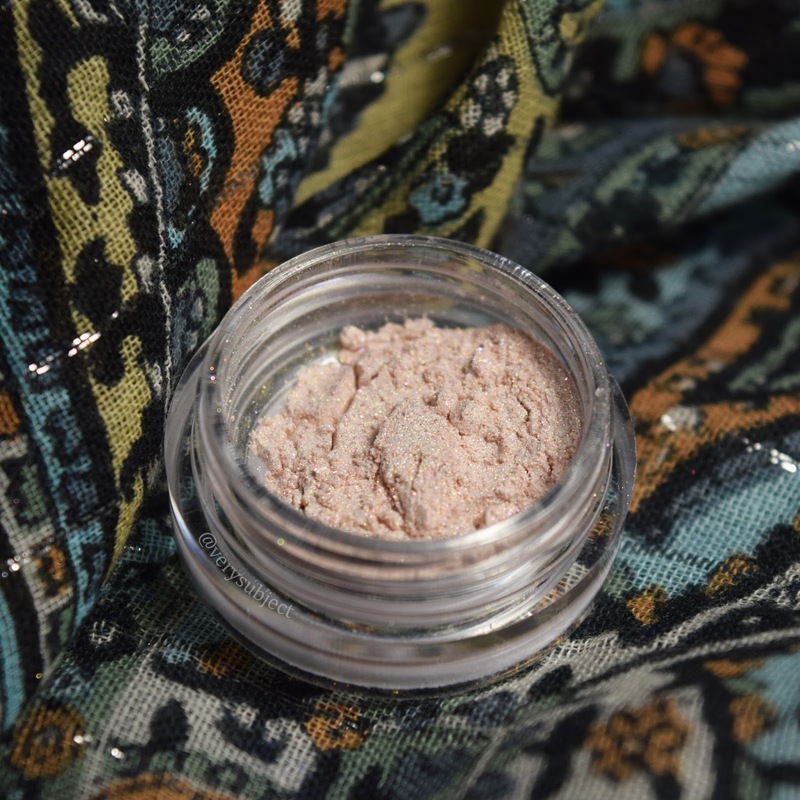 If you're a fan of Femme Fatale's Candied Apple but wished it were warmer, or Shiro's I Loved a Maid but wished it were paler, then this is the eyeshadow for you. It's similar to the LE Femme Fatale Balmy Summers, but more opaque, paler, and a little bit pinker. Shiro's description: "Delicate peachy-coral with strong green shift". This one seems like more of a stretch for a face highlighter; the base seems too opaque to me. But then, I didn't try it on my face, so if you do and you like it, be sure to tell me! Over Pixie Epoxy—angled for maximum shift! Dandelion Love Test is another must-have form this collection for me. It's a strong matte pastel yellow base with fascinating blue sparks. 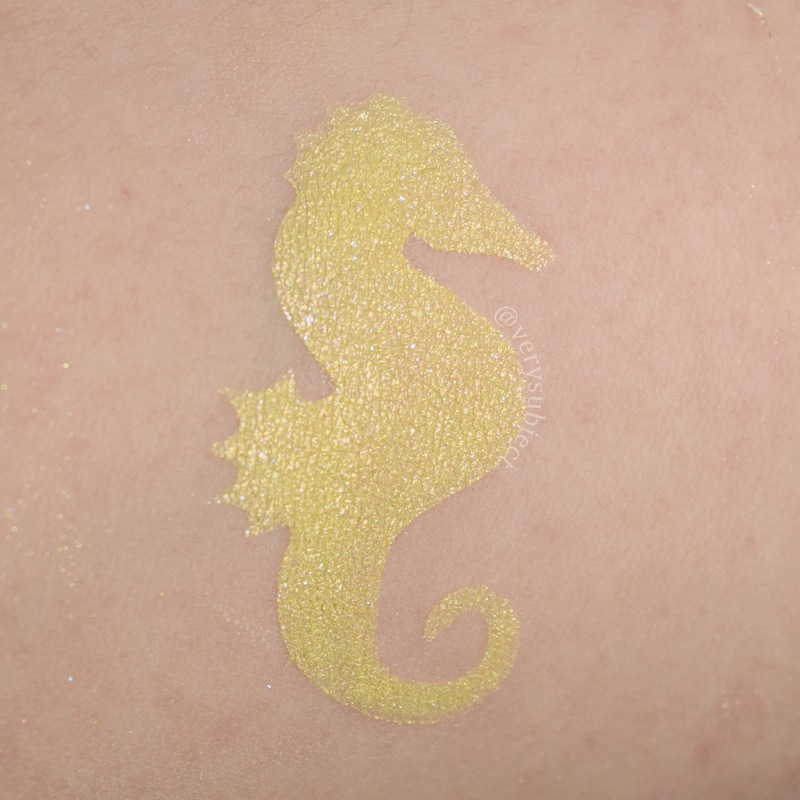 Shiro calls it "golden yellow with sunny orange shimmer and light blue flecks". 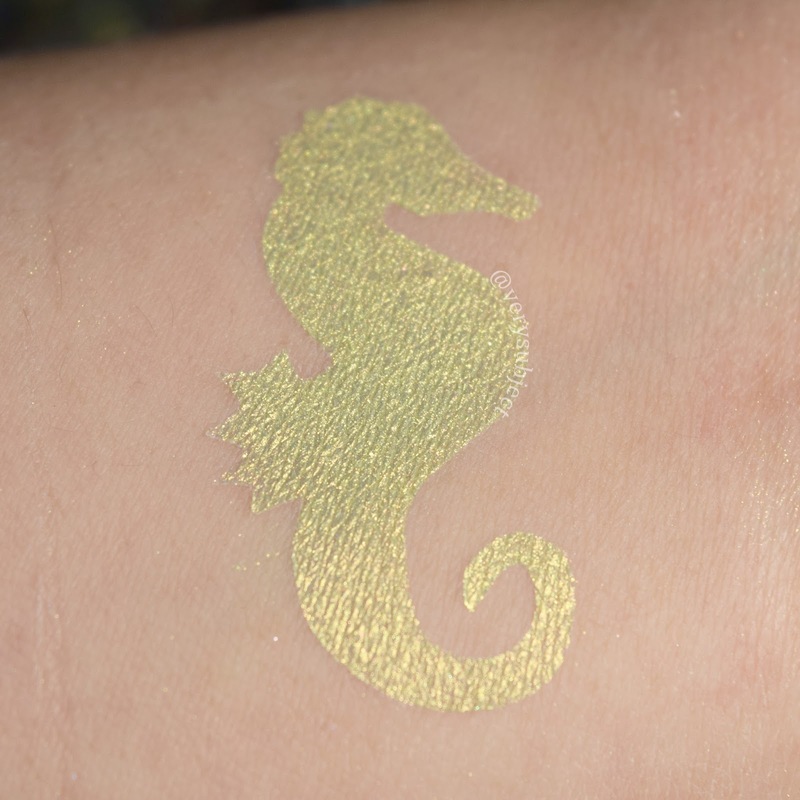 I didn't really see much of the shimmer and thought this shadow performed mostly like a matte yellow. 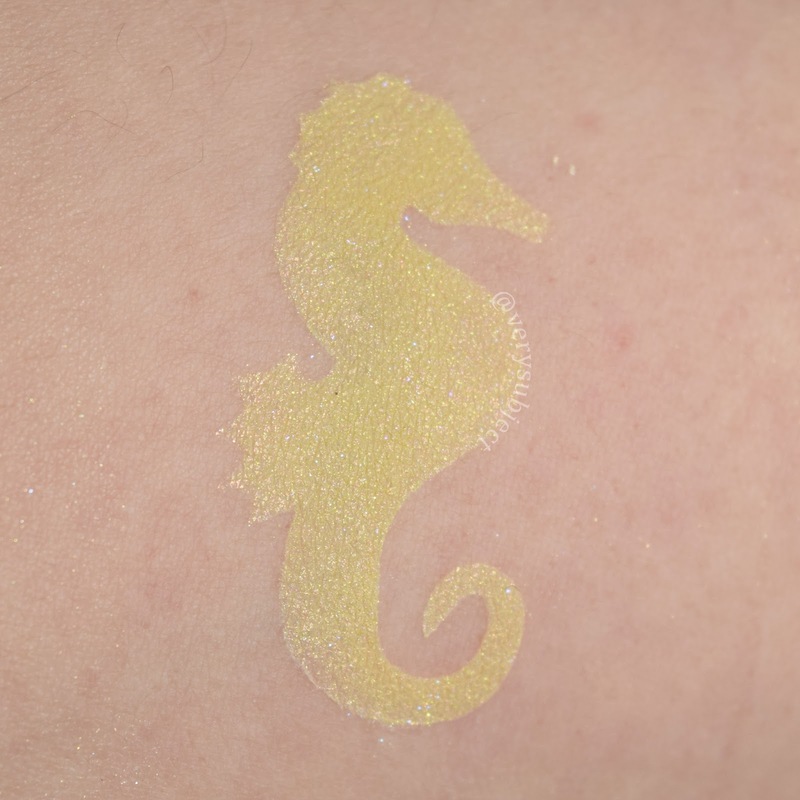 However, it looked really good over both normal primer and glitter glue, and I thought it was really easy to work with. I cannot see myself ever using this as a face highlighter. Okay, so I know that chartreuse shades like this are not normally popular, but let me make a case for why you need March of the Leaves. It's perfect. 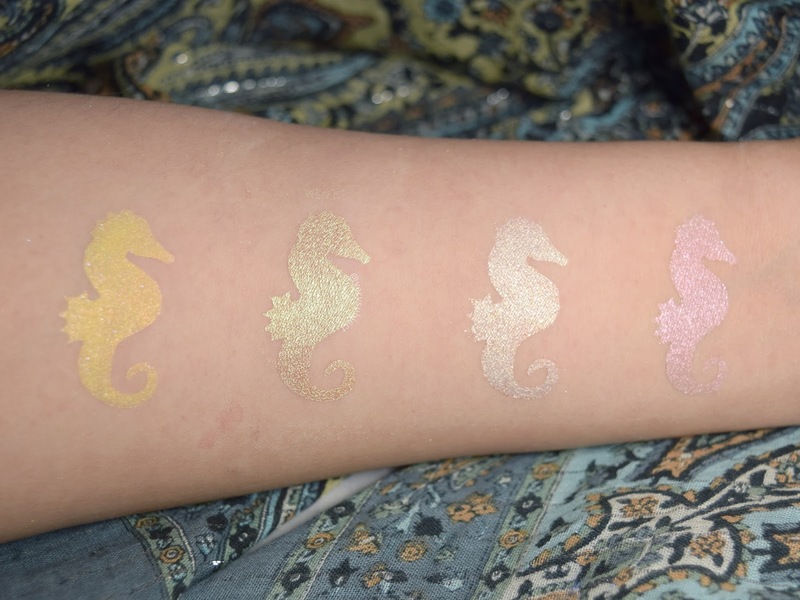 I can barely tell apart my swatches of it over normal primer and sticky base, even though it's a subtly shifty, shimmery smooth smooth smooth complex little shade. It's going to look SO good paired with purple, or black, or pink, or blue, or green, okay yes literally any other color for a bright contrasting shade. And did I mention how smooth it is? 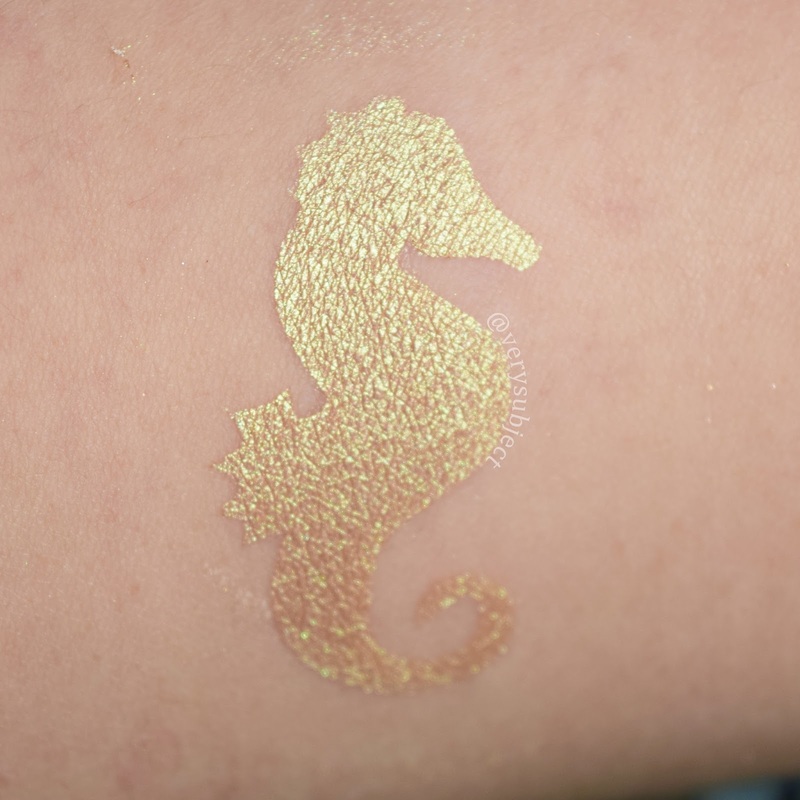 It just goes on your skin and it wants to be there. It's happy to work with you. It lends you its full cooperation. I love it. 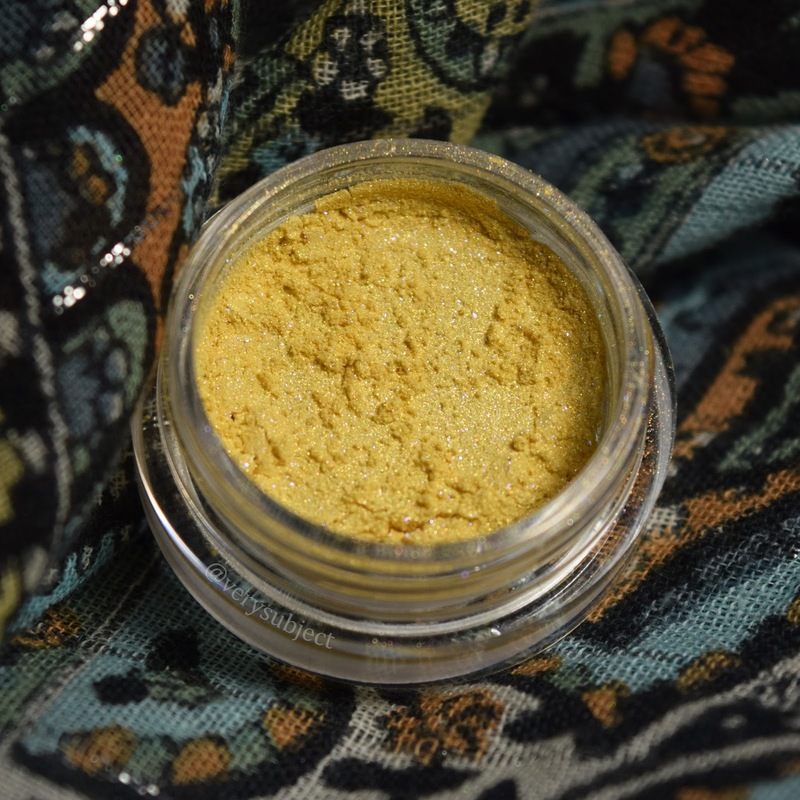 It's a golden-yellow shimmer over a yellow-green base. I probably wouldn't use it as a face highlighter, though. 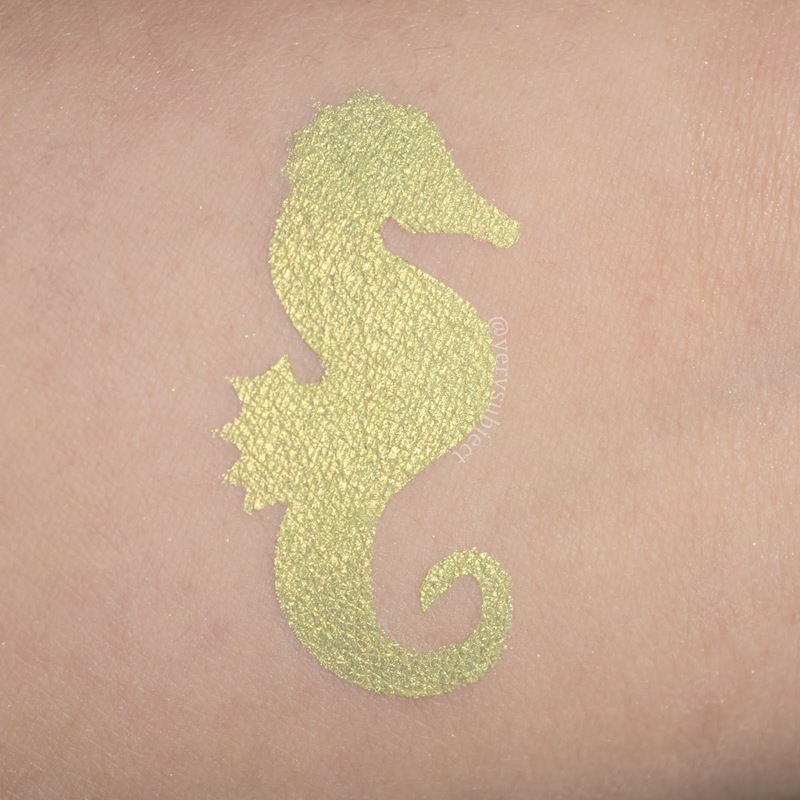 Shiro calls it "shimmery golden-chartreuse, the color of midday sun on new grass". Lorac Behind the Scenes, angled to show shift. Yes, that's right, I took the shifty shot over NORMAL PRIMER. Matching Flower Crowns is a muted green with shimmer. 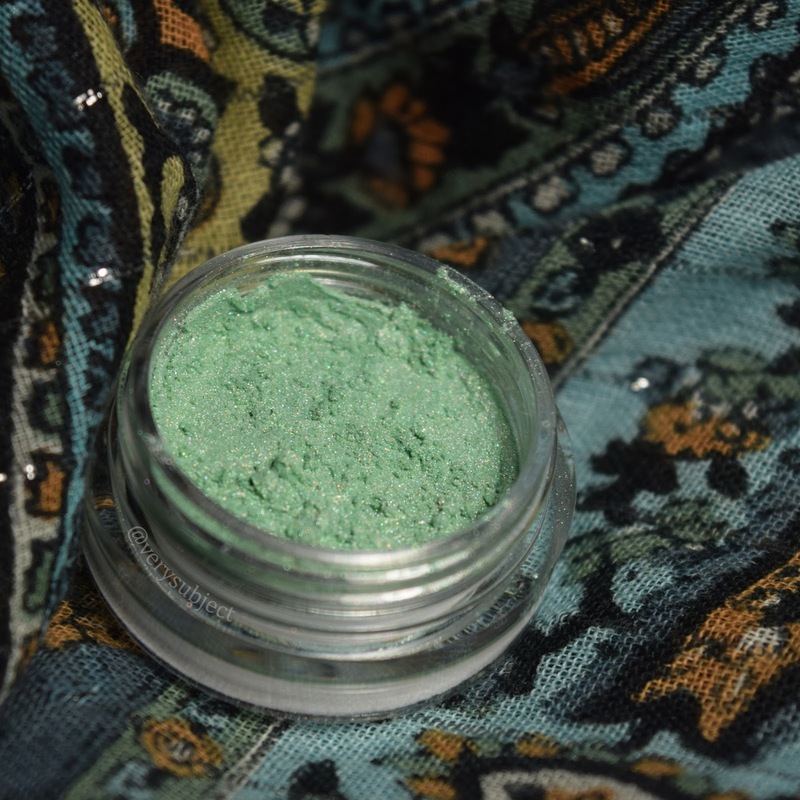 I think the base is kind of a spring green, but the shimmer (which if you look closely at, you realize is pink) neutralizes the base color a bit and you end up with this more somber pastel green. 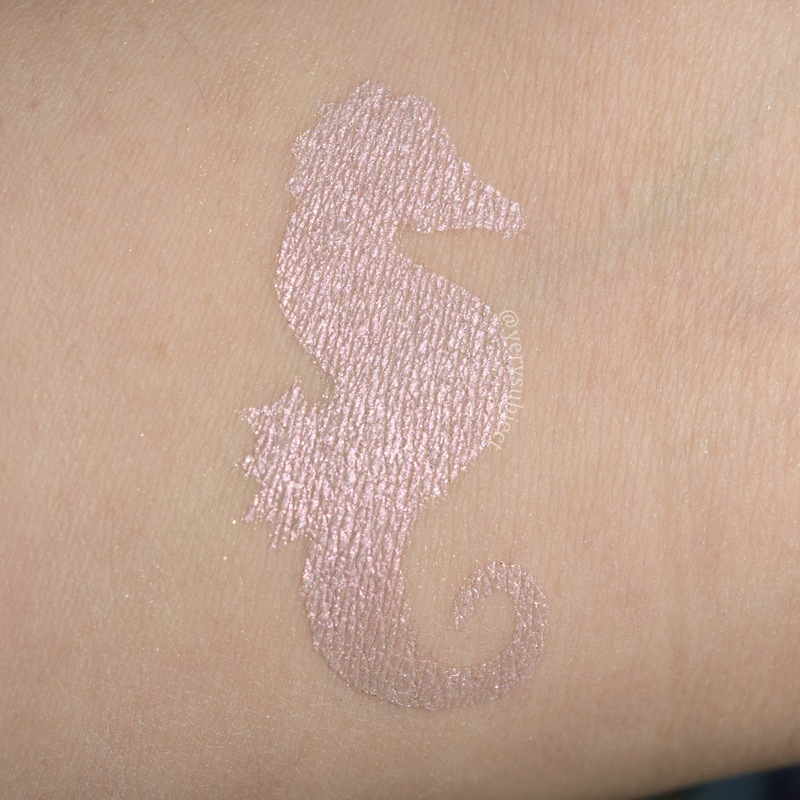 It's pretty sheer on its own; I might try it as a face highlighter sometime if I'm feeling a little daring. 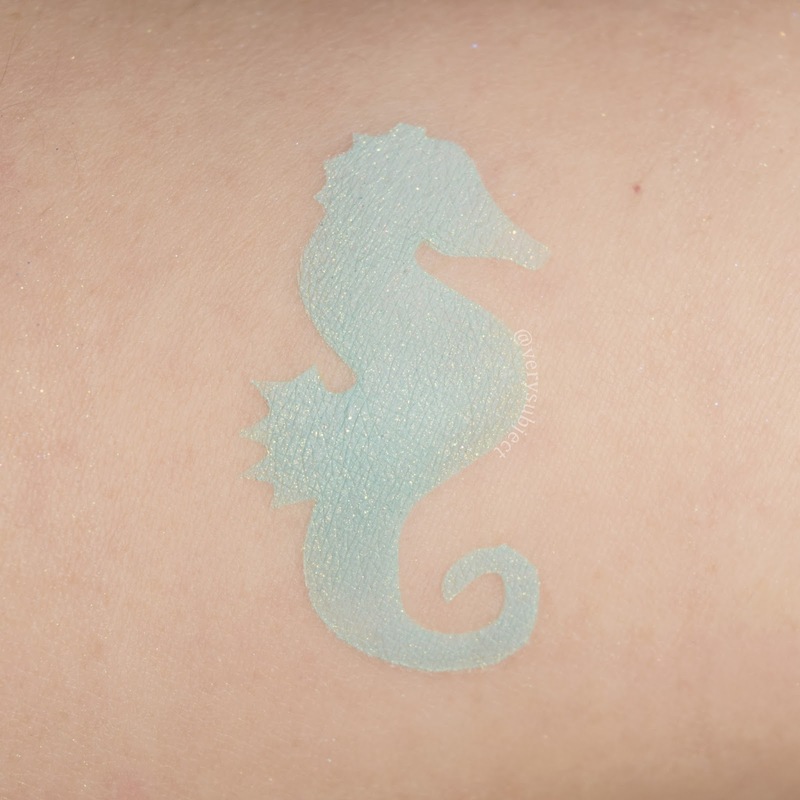 Shiro: "soft seafoam green with strong pink shine". 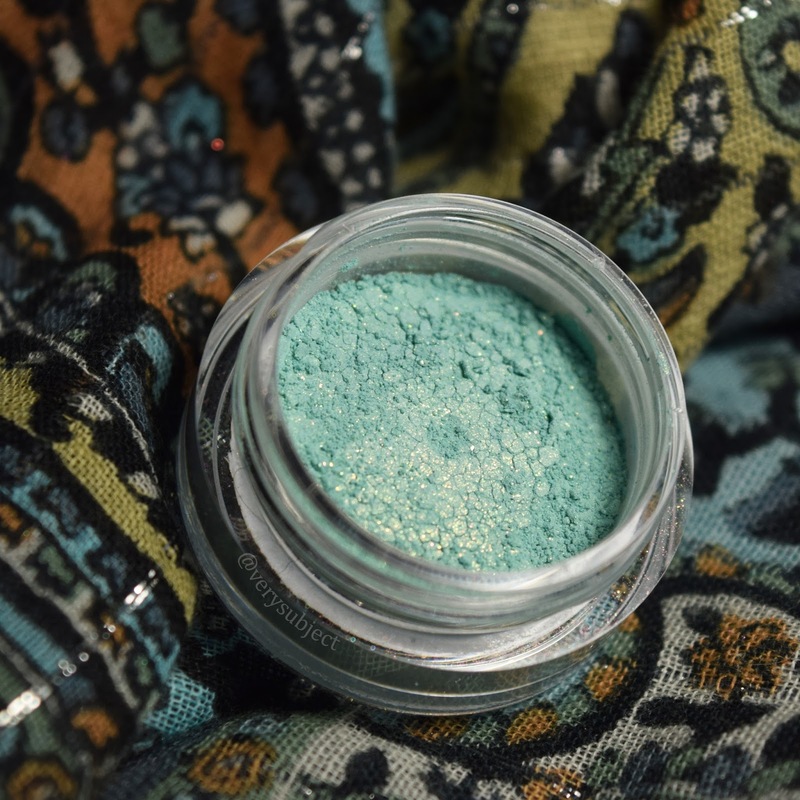 Song of the Puddle Siren is a smooth pastel teal shimmer. I think it comes out as a pastel teal and not an "aqua" or "turquoise" because it's a little bit muted. 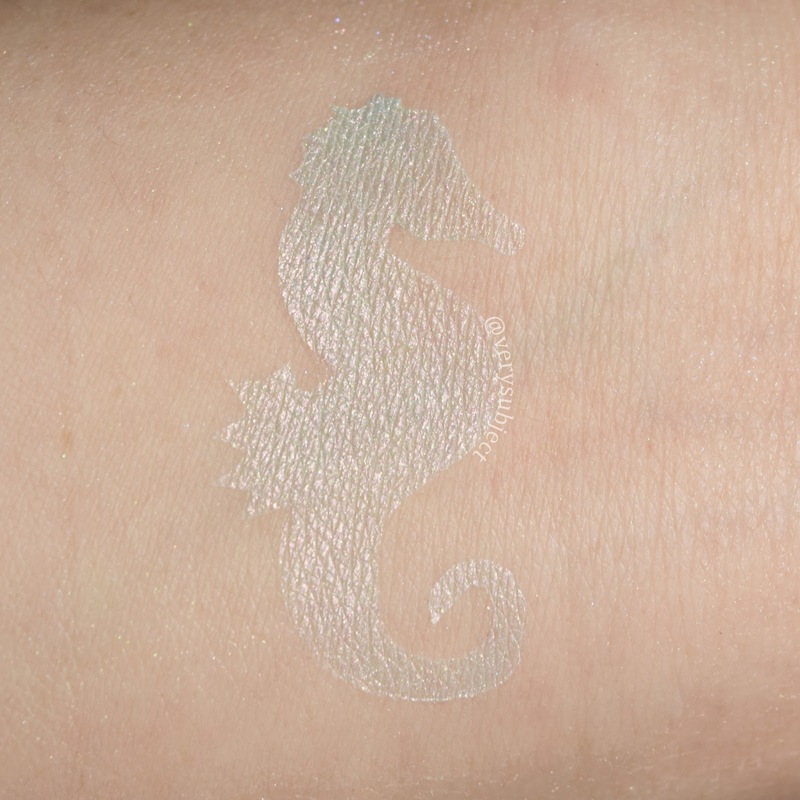 It's pretty sheer over normal primer, and I think it might make a decent face highlighter because the base color doesn't have much of a presence. 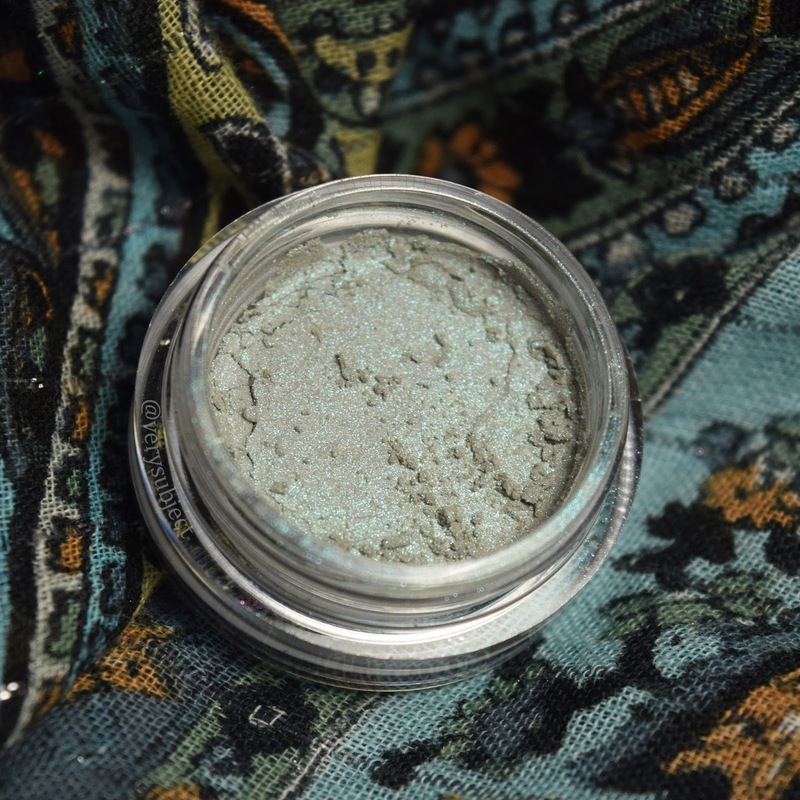 Shiro calls it a "light satiny beige base with extremely strong blue shift". For how very different the jar shots look, I was a little disappointed at how close Song of the Puddle Siren (SotPS) is to Matching Flower Crowns (MFC). There are differences, but you probably would have trouble seeing them from afar. 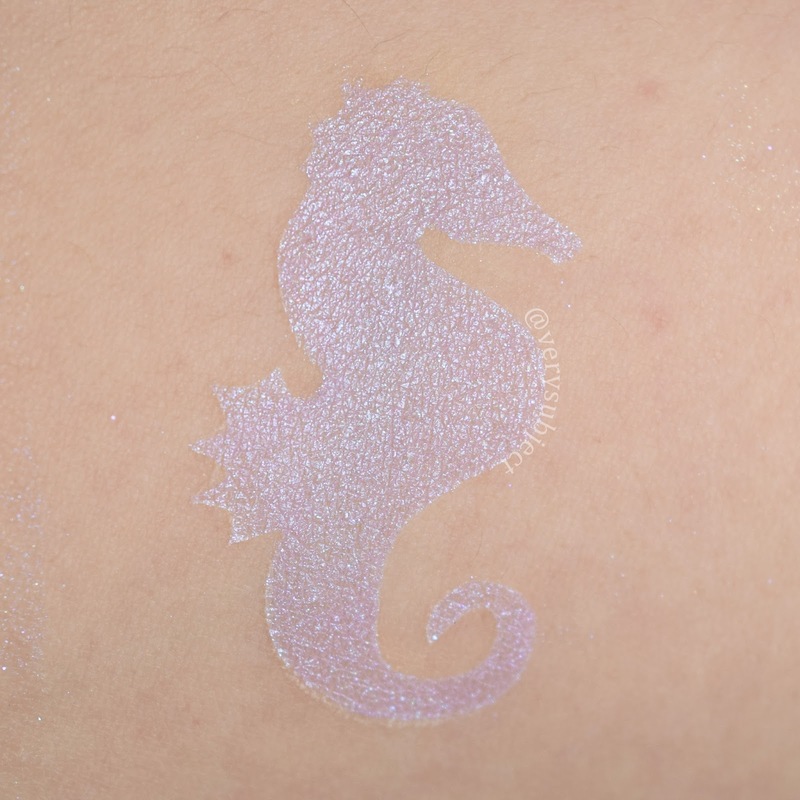 MFC is a little coarser looking, and of course has the subtle pink shimmer. 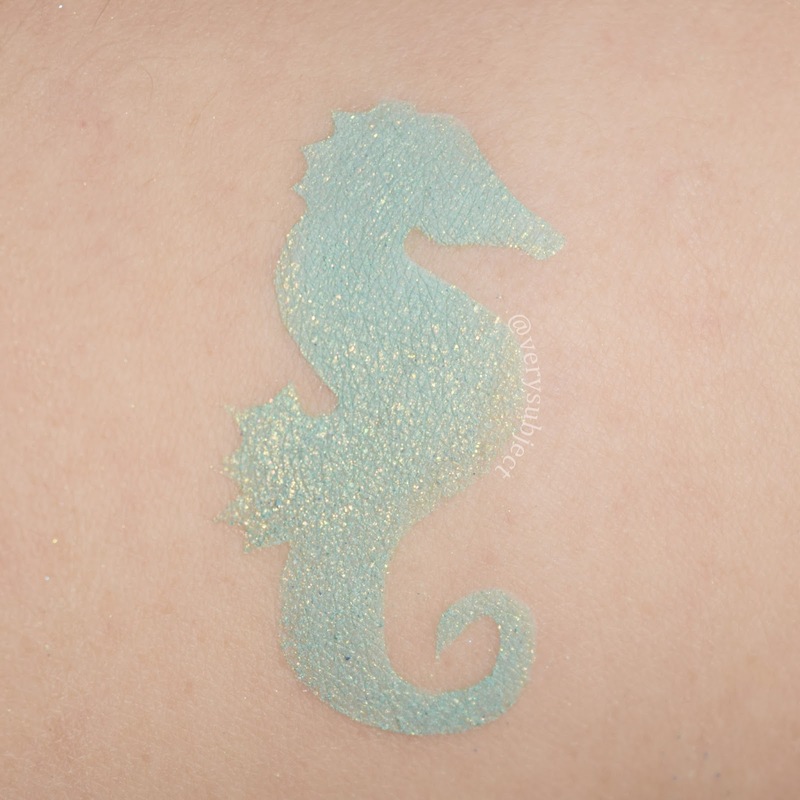 SotPS is smoother and slightly bluer, plus the shimmer in it is aqua. 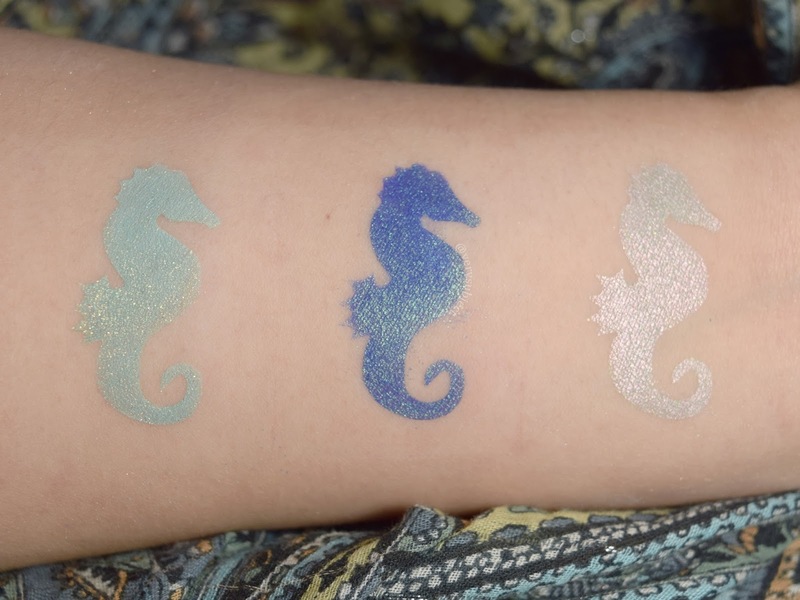 The differences really come out over glitter glue (as you can see in the shot of all the swatches next to each other), but over normal primer, the two shades end up looking almost the same, even in person. Purple! 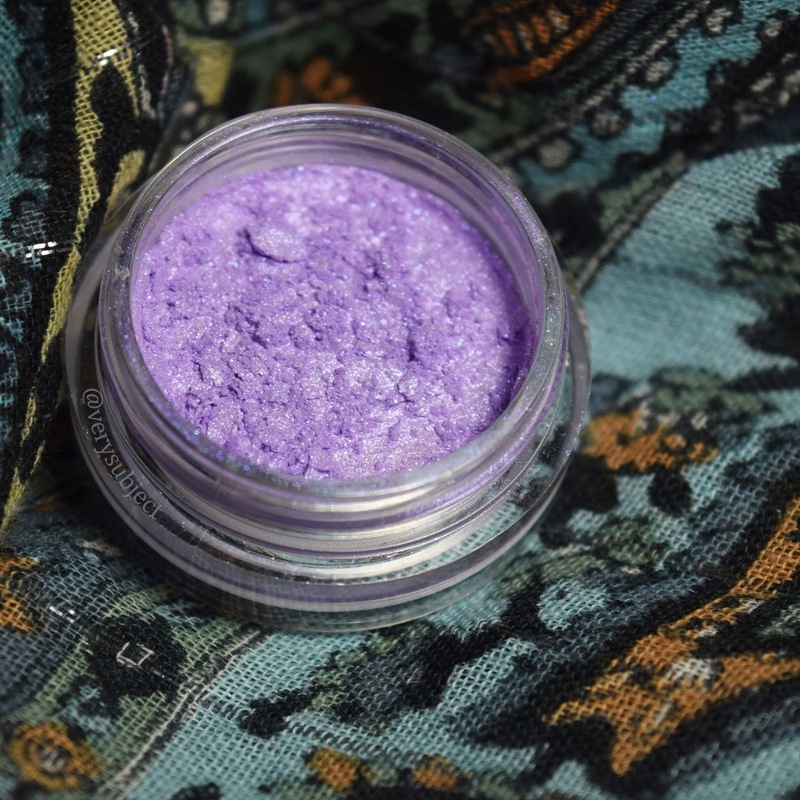 Fairy Ring Roundel is a delightfully smooth pastel purple shimmer with hints of blue sparks peeking out at you. It's like if the Esper Elemental Glow had a baby with Alkahestry and it came out more mellow on the blue sparks than Alkahestry, but lost none of the glow of Esper. It's also really smooth and way less prone to losing the sparks all over than Alkahestry is. In short, this is a great eyeshadow and I think it'll make a great face highlight as well! 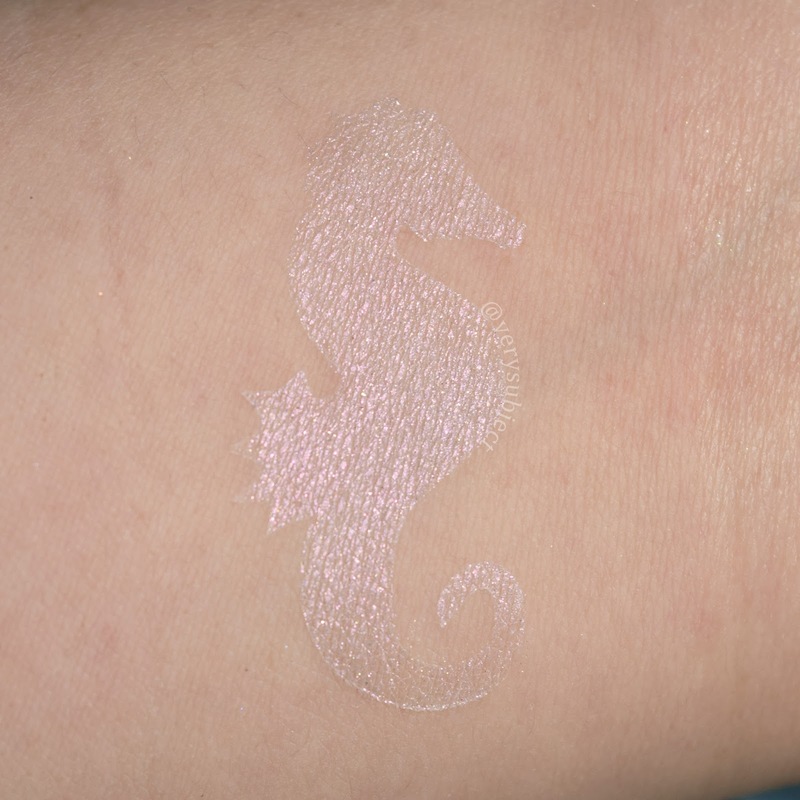 Although it's pretty opaque in the primer swatch, it's easily sheered out and very blendable. Shiro: "pale lilac with cool blue shimmer and sparkle". Okay! That's it for Spring, Sprung; three more shadows and we can move on to the next post! 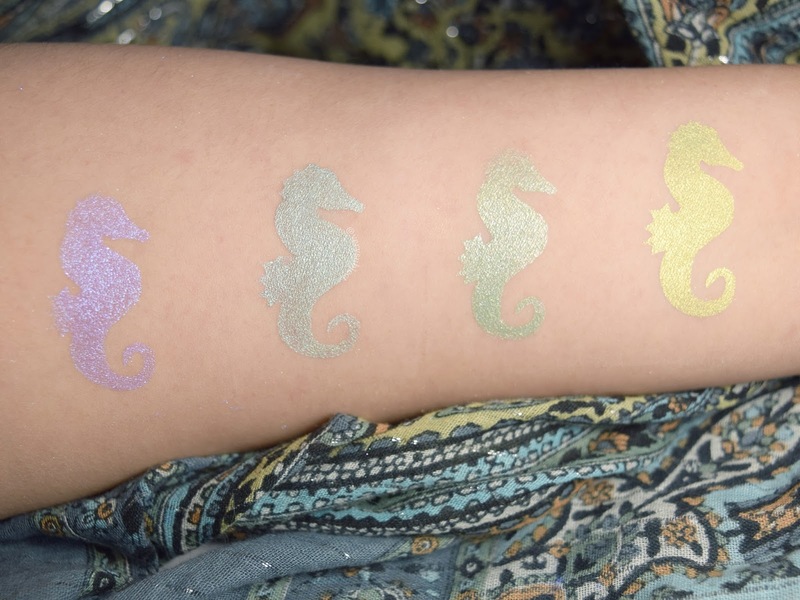 These next three shadows are all limited Shiro Color of the Month shades. While they are limited and will be hidden on the site when their month is up, most of them will be available until the next annual CotM clearout in June. You can find them by searching the site for "color of the month" or by clicking this link. They are only available as full sizes. Every year, the most popular CotM from that year will be saved from discontinuation by placement in the High Scores section of the site! 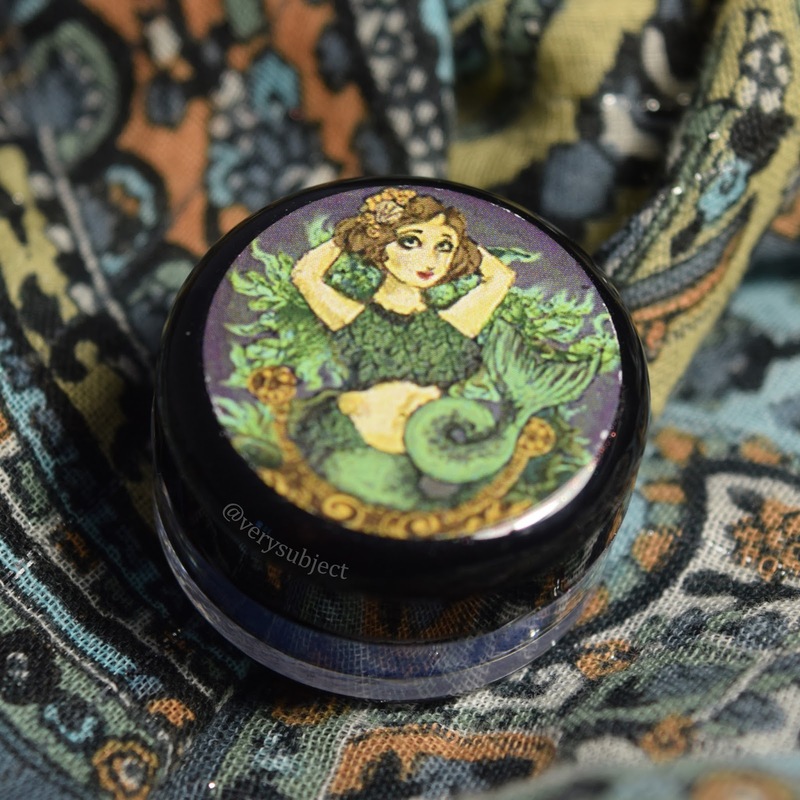 Sunshower is the CotM for March; Mermaid You Look! 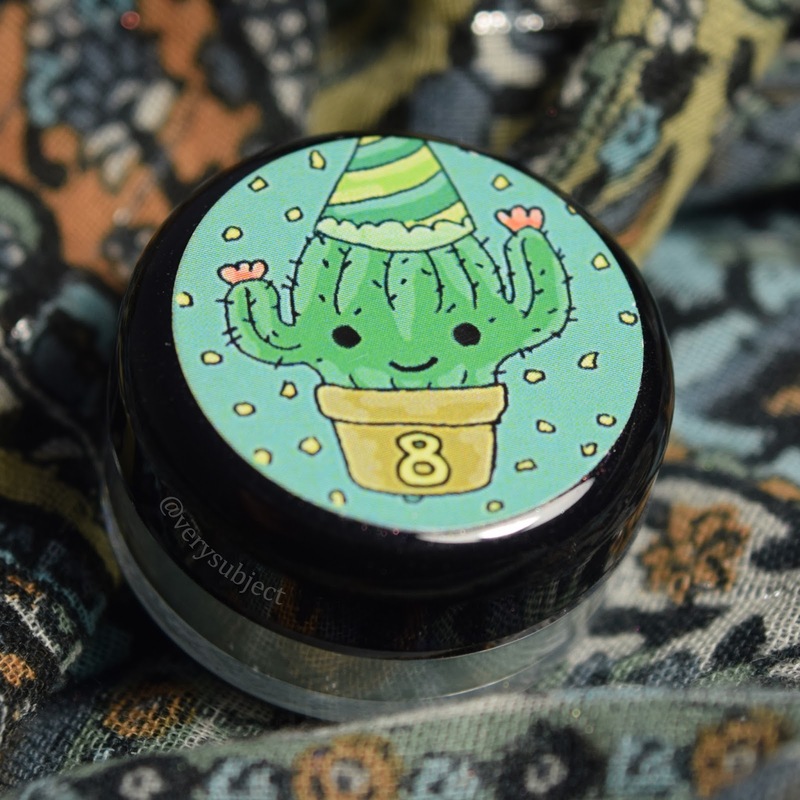 is the CotM for May; and Celebr-eight Good Times is the special anniversary shade that comes free in the sale with a purchase over $30 before discount. And yes, I know it's not exactly a CotM, but I'm counting it because you can find it in the current CotM section on the website. Is this label art not the cutest?! Celebr-eight Good Times is, as I've probably said fifty times by now, Shiro's 8th anniversary gift with purchase shade. You can, of course, buy it yourself, but it also comes free with any purchase over $30! And yes, that is before discount as well as before shipping. 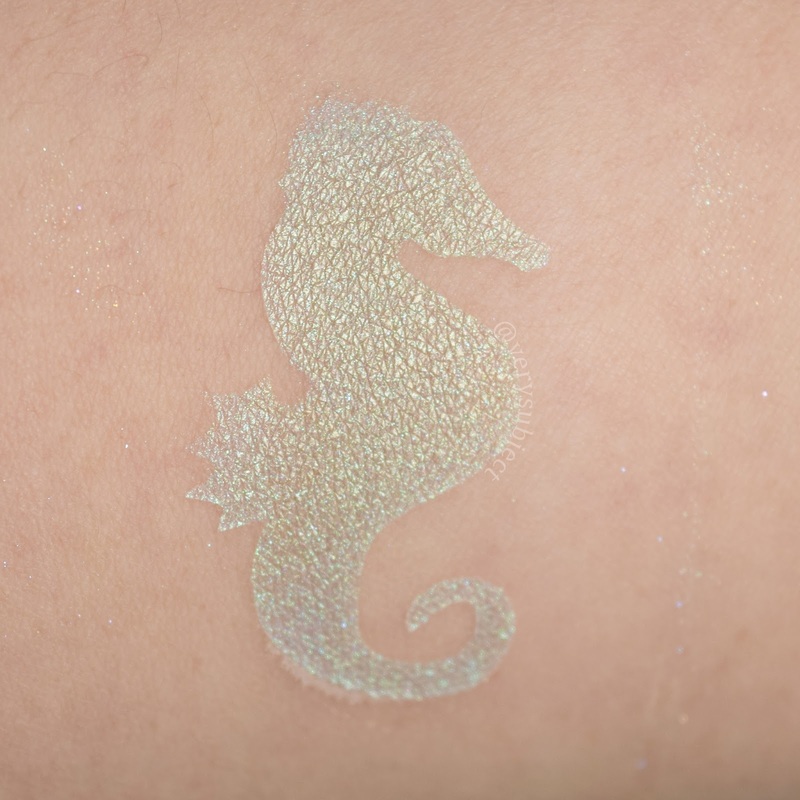 It's a very saccharine soft pastel mint with sumptuous gold shimmer running throughout. 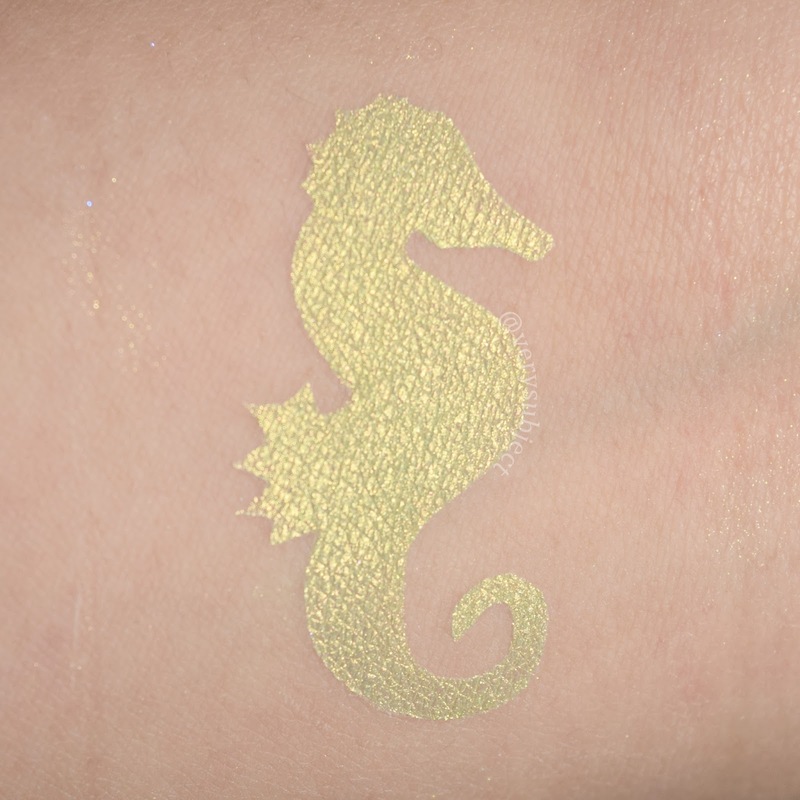 I liked it over normal primer but I thought the gold in it did better over sticky primer, so I'd probably recommend using it over a cream base. It was a little powdery (albeit pretty opaque) over normal primer, and deepened a bit over the sticky base. 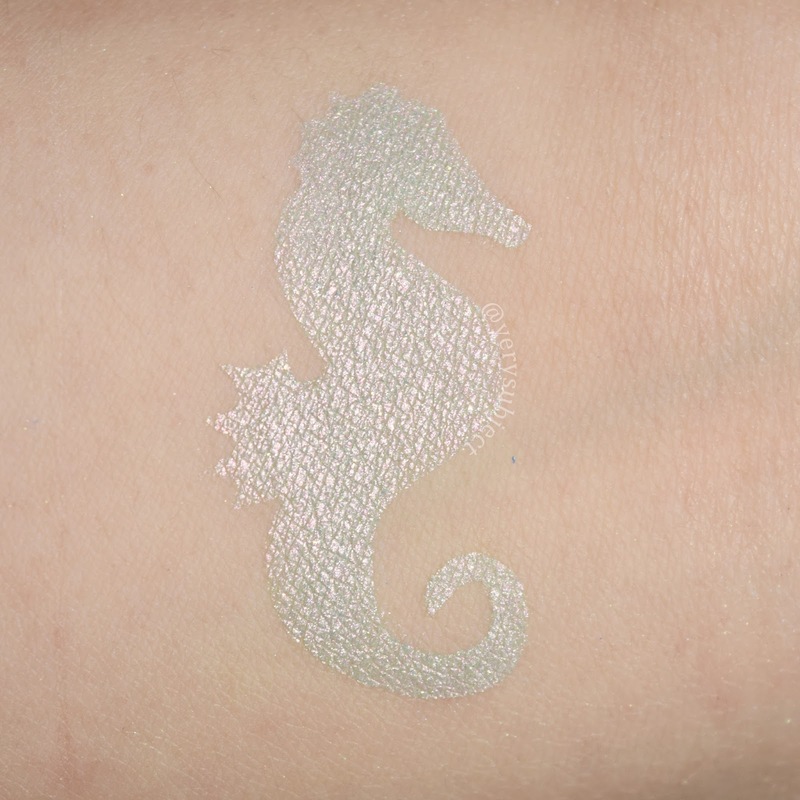 Shiro: "A charming mint-ice-cream shade with gold flecks". Mermaid You Look! 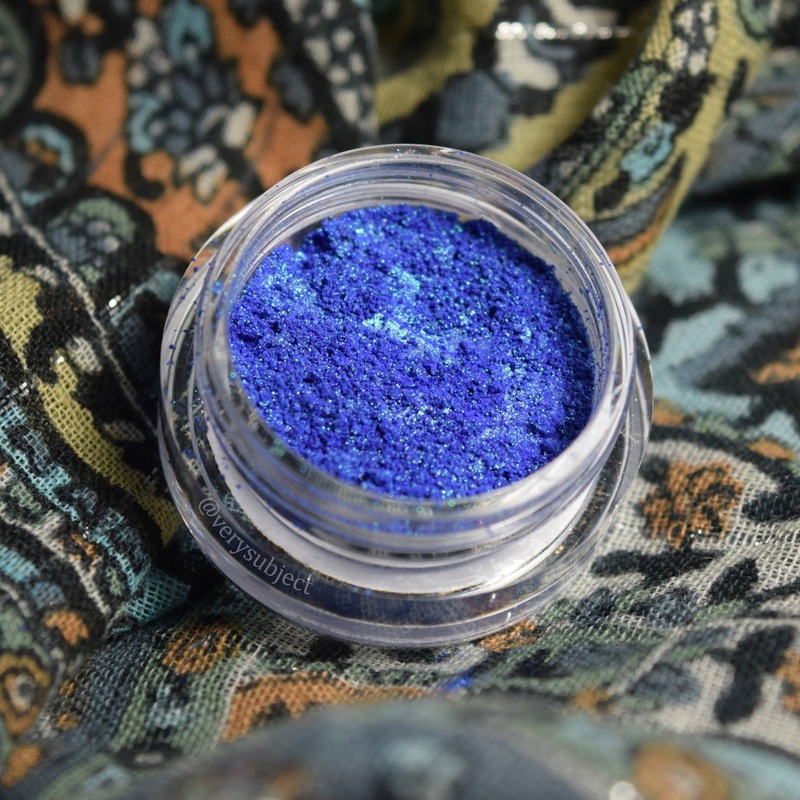 is a very bright matte blue with a bright green shimmer. This does not do well without sticky base, and I found it to be not quite as smooth as I wanted, so it needs a little bit of extra work to look its best. 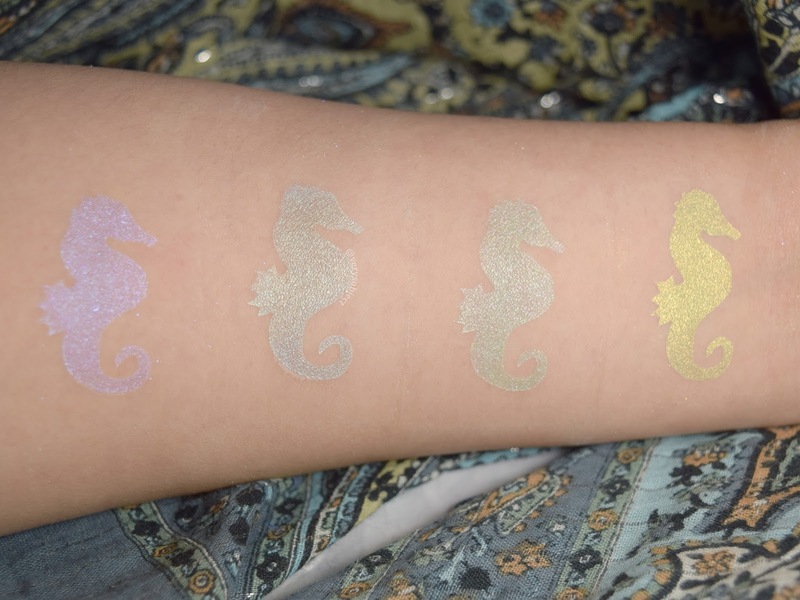 However, I don't think it'll take too much extra work as I did swatch these in a bit of a hurry. It's such a great summer pool shade! I'm just itching to use it as an all-over lid shade with a terracotta orangey-brown crease. 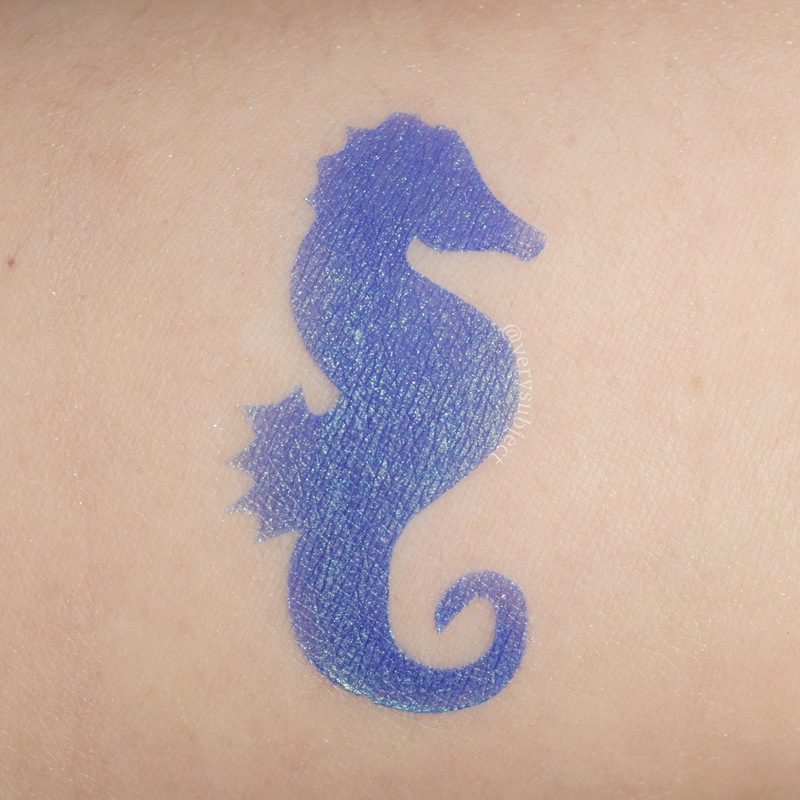 I bet the green shimmer will add an extra bit of twist to that classic look. Shiro: "a vivid cool blue with aqua-green sheen". We are finally at the end of part 1! Sunshower is a CotM from earlier this year, so you'll have to search the website to find it (or just click on the handy link I provided!). 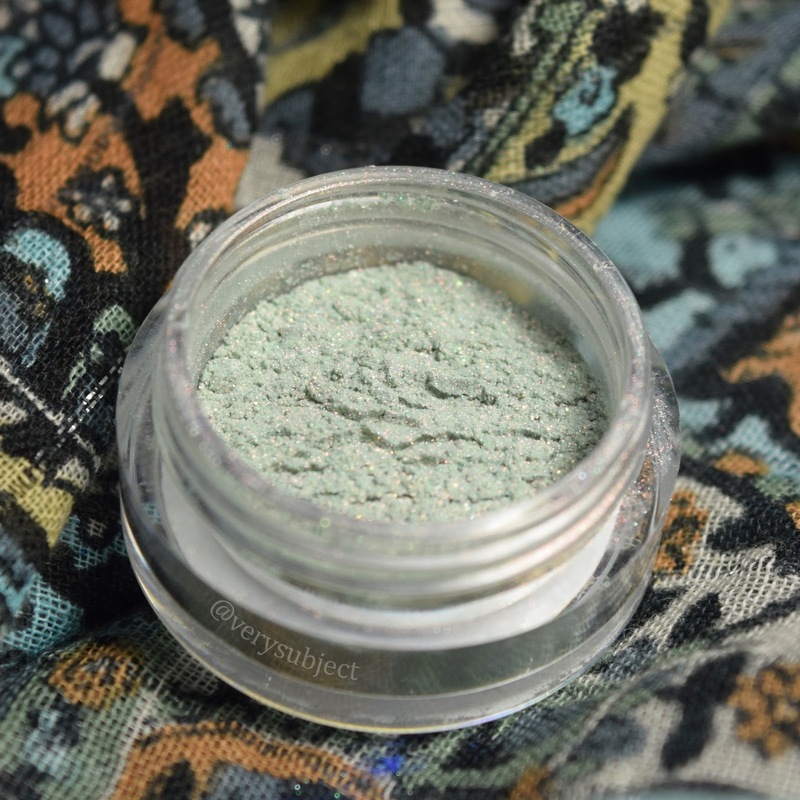 It's in the same vein as some of my other very favorite Shiro shades: a glitterbomb! 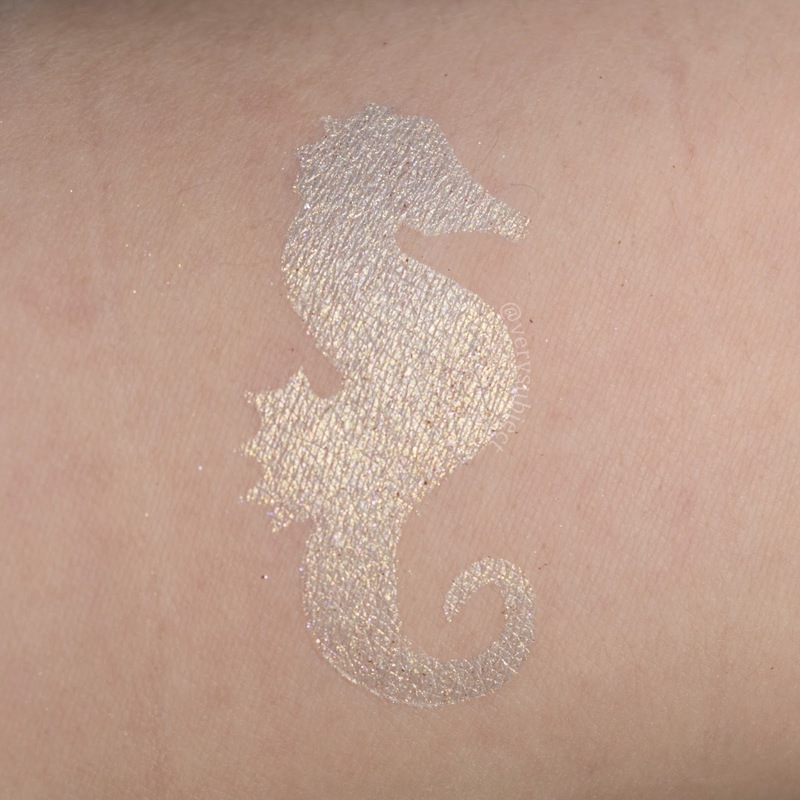 It's very pale and sparkly and I would definitely recommend using it in conjunction with a sticky base. 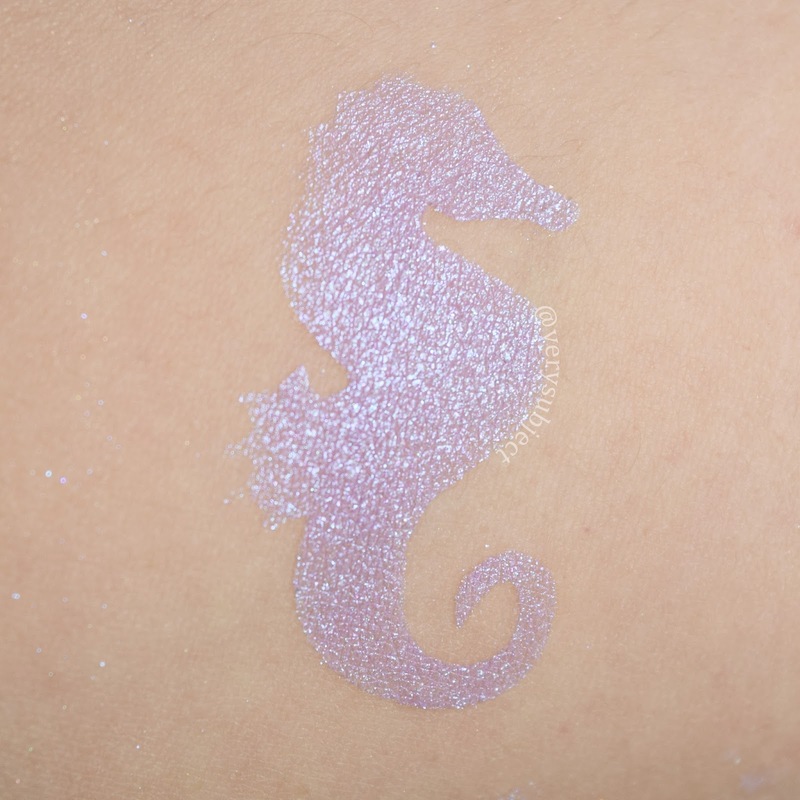 I but it would look amazing on the center of the lid over the top of a darker shade for an easy, sparkly halo eye. I think I've shared my very effusive feelings on this formula before, so I won't repeat myself again here, but suffice to say I like it. 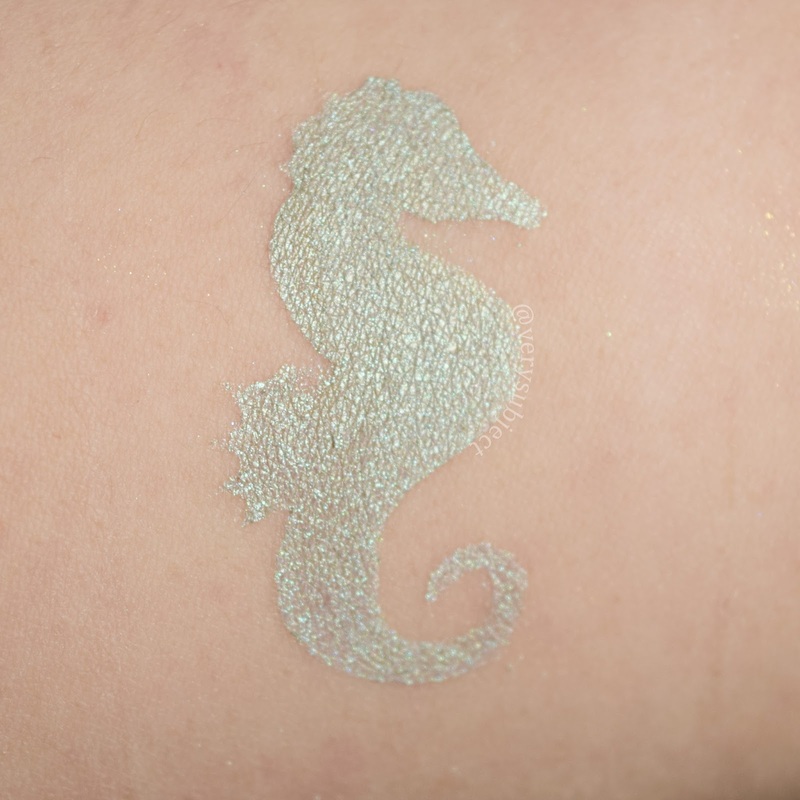 I'd describe it as a pale, sparkly seafoam green glitterbomb with coppery pink shimmer and gold sparkles. In some lighting, the pink makes the green base look grey. 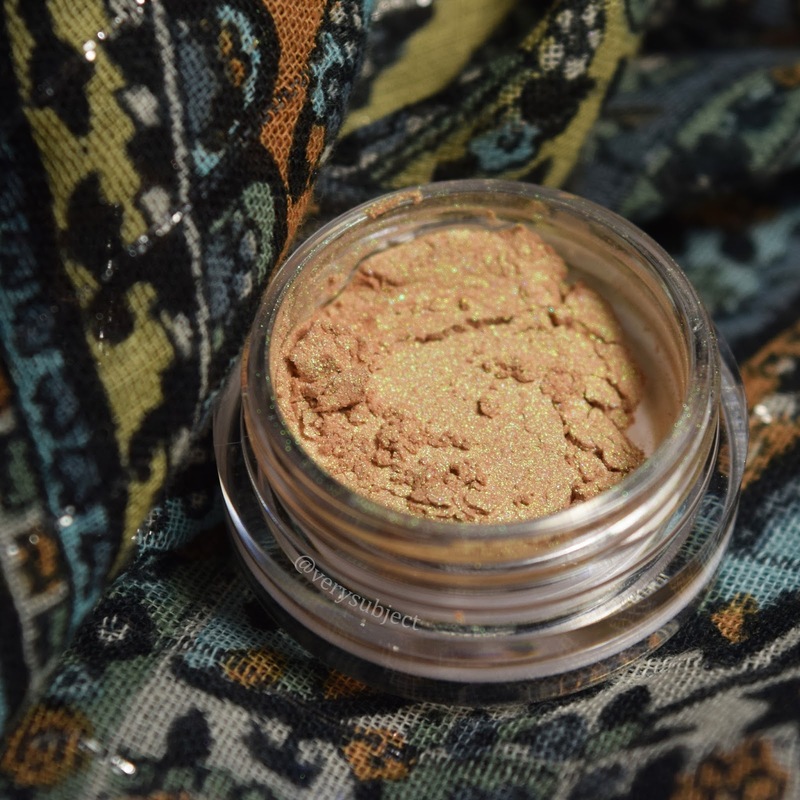 Shiro: "delicate new-bud green with strong pinky/peach shift and a scattering of sunny copper sparkles". Alright! Thank you for your attention! Next up, we'll be taking a look at the Shiro Multisticks, a new cream product meant to be used as color for face and lips. I'll have that up later today, but for now I'm going to take a little break from writing because I am tired and there is so much to do. Leave me your thoughts and comments! Click here for the Multistick review! Hi, can you give me a drugstore or indie example of a cream primer? Hey! 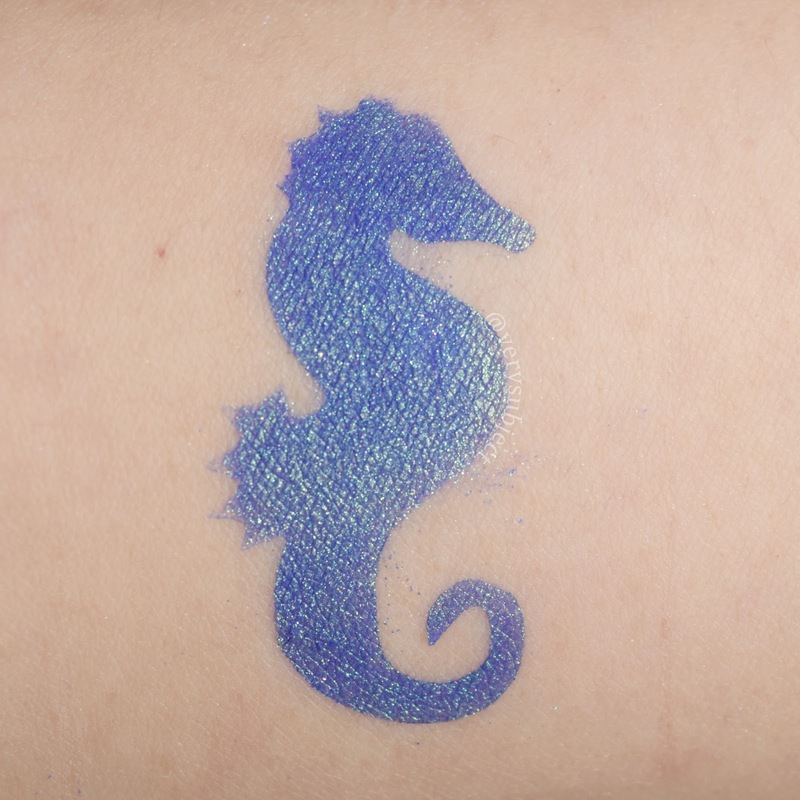 Mac Paint Pots are cream primers; I like the matte/creme Maybelline Color Tattoos but they were discontinued. Nyx "Eyeshadow Base" would work as well, though, and in a bind you can just use a cream concealer!